The two artists who make up FORT, Alberta Niemann (*1982 in Bremen) and Jenny Kropp (*1978 in Frankfurt am Main), work with everyday objects that they adapt and transfer to the exhibition space. For all their supposed familiarity, the objects and settings created often have a subtly surreal character and evoke an eerie atmosphere of emptiness and desolation. Many of the objects shift between poetic and humorous moments and play with the viewer's usual way of seeing things. In the exhibition Night Shift, FORT explore the theme of night and darkness. 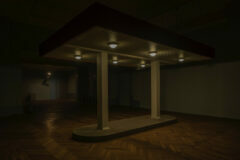 The Casino Luxembourg rooms remain dark throughout the exhibition, with only the works shining with their own light and providing some orientation for visitors. The title Night Shifthas two meanings here. In the first place, there is the literal sense referring to night-time work. This is also a popular theme in literature and film, tapping as it does into issues like loneliness and isolation as well as aspects of the mysterious and uncanny. Secondly, the title plays with the interplay between the two concepts of "night" and "shift", alluding to the irrational and mystical qualities that have been attributed to night and darkness since time immemorial. "The night doesn't swallow us, it makes us stumble", says a Sorbian proverb, symbolically questioning our belief in the laws of reality. But a South African proverb tells us that even at night, milk is white. The exhibition is positioned at this intersection of reality and subtle magic, the rational and the irrational, known and unknown, and creates an atmosphere of impermanence and desolation that is a hallmark of FORT's work.